Peru is ancient yet vibrant. While some of its treasures have famously been hidden in lush, dense jungles for thousands of years, some of them have been lived in, or danced through, or carried through crowded plazas as part of colourful pageants. Ancient traditions and mythical beliefs are kept alive here in exciting festivals, and there’s much merging of mythology, with ancient deities and Incan rulers becoming Christian saints. There’s also plenty of merging when it comes to cuisine and hospitality, and the best places to stay in Peru blend old and new to oft elegant ends. For the food is really something. Borrowing from their own traditions, from the Spanish colonisers and the Africans brought here, fusion food has been the norm here long before it became ‘a thing’. The challenge of Peru is planning your itinerary. But we’re here to help with our recommendations for the best places to stay in Peru. Lima is a graceful colonial city turned sophisticated, built atop a pre-Colombian city. So there are colonial buildings right beside ancient temples and modern cafes and bars, and all sandwiched in between crumbling cliffs above the Pacific Ocean and a collection of pretty towns in the foothills of the Andes. Lima as a city dates from around 1535, but its satellite offshoots are like expanding islands of modernity. When you read ‘Lima’ its impressive museums might come to mind, or the growing reputation of its culinary circles, or its religious processions? or even its latin rhythms and party scene. Cusco - or Cuzco or Qosq’o - is the cosmopolitan once-capital of the Incan Empire. And, as well as being arguably one of the most fascinating cities on the continent, is also the closest city to Machu Picchu and the Sacred Valley. The beautifully preserved colonial architecture, and the way it’s arranged around the older Incan structures, is one of the most wonderful things about Cusco. Narrow cobbled passages open out into graceful squares where ornate churches rub shoulders with low-rise Incan temples and you’re just as likely to see pet llamas as you are to see expensive alpaca wool clothing for sale. Cusco is also known for being 3.400metres above sea level and a great place to acclimatise - or get altitude sickness if you’re unlucky. And of course Machu Picchu follows. The beautiful ruins of Machu Picchu have become a recognisable symbol of Peru, and possibly even South America. At the bottom of a dramatic ridge of rock, these wonderfully preserved Incan buildings are the reason many people travel in this direction. For some people to see the city - which was lost for hundreds of years - is enough, but for some of us the journey to the city, through the mountainous jungles is part of the experience. Cusco is the closest city, but Aguas Calientes is the closest town: it sits below this ancient Incan citadel, and that’s the main reason people come here, but they also have other entertainments on offer, including hot springs and a zoo. If you’re planning to walk to Machu Picchu on the Inca Trail a good place to start is Urubamba. This small town is spectacularly surrounded by snow-capped mountains, but it’s not too high - yet, it’s considered a good place to stay to acclimatise. It’s also a stop on the railway to Machu Picchu, known for its beautiful Belmond Hiram Bingham train. Peru’s next most famous sight is probably Lake Titicaca? Puno makes a great base for exploring the lake and surrounds and has a rich history and impressive architecture itself, too. Puno also has a feeling of the seaside - the lake is enormous, It’s also got a wealth of pre-Incan ruins, stunning islands and wonderful traditional fishing boats to admire. Once you have seen Machu Picchu, the Sacred Valley and Lake Titicaca, the next step on your Peruvian adventure might not be so clear. Arequipa, the former capital, is surrounded by volcanoes, and sits, majestically, beside the Socobaya river, Colca Canyon and the Aguada Blancas National Park. But it’s the architecture that people really talk about, the breathtaking cathedral and the Plaza de Arms. Nazca, with its puzzling shapes and geoglyphs marked into the ground, is certainly of interest to a lot of people too. As are the ruins of Chan Chan, and the fortress at Kuelap. Second Home is a five room boutique hotel perched on top of a cliff overlooking the Pacific Ocean. Formerly the home of a sculptor, there’s still plenty of bright, contemporary art on the walls. The breakfasts are luxurious and drinks are served in the peaceful gardens. The Country Club Lima Hotel in San Isidro has been converted from a 1920s built English mansion and has 83 elegant rooms and suites, a pool, gym, golf course and a superb restaurant which has won the award for the best restaurant in the whole of Peru five times. As well as five star luxury, the Belmond Miraflores Park Hotel also offer stunning ocean views from many of its 81 rooms and suites. There’s a great rooftop pool, plus a spa and gym and an Asian-Peruvian restaurant. 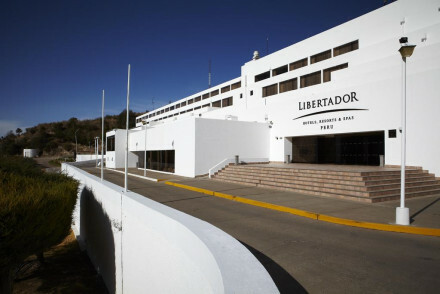 The Atemporal Hotel is a retro boutique nine room hotel in the quiet neighbourhood of Miraflores. The decor features plenty of black and white photography and they serve an indulgent breakfast. 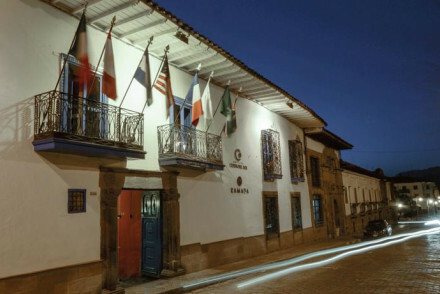 The Palacio del Inka is an elegant 203 room hotel right in the historic centre of town. The decor is colourful, from the smallest room to the excellent Andean restaurant. There’s also a range of spa treatments available. El Mercado offers a fabulous mix of tradition and contemporary decor in the centre of Cusco. There are exposed beams and white washed walls but there are also some great pieces of modern art. There are 31 rooms plus a gorgeous terrace, perfect for drinks in the evening. 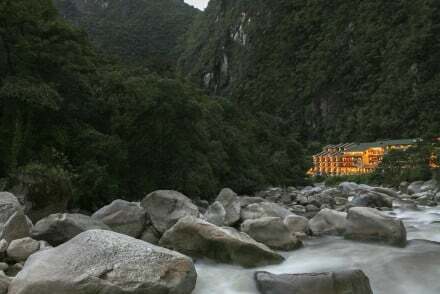 The Belmond Sanctuary Lodge is an incredibly luxurious way to experience Machu Picchu. Located just outside the site’s entrance, the hotel offers great views and fantastic food in a place like no other. 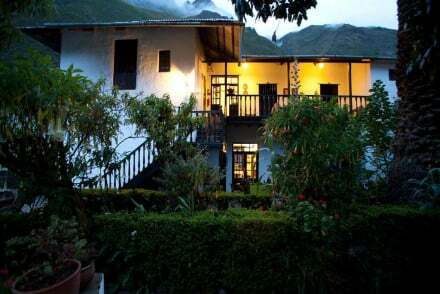 El Abergue is a chic and comfortable hotel situated within the Ollantaytambo train station where trains take you directly to Machu Picchu and Cusco. With intimate and rustic rooms offering great views over the green surroundings, it’s the perfect starting point for any adventure. There’s also a sauna to unwind in! 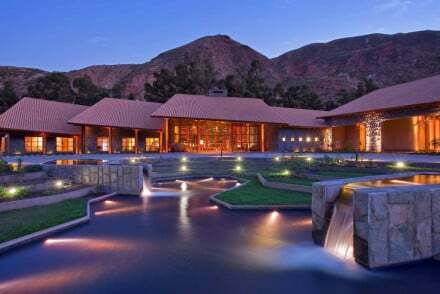 The startlingly modern architecture of Tambo del Inka is a surprise against the backdrop the Sacred Valley, but it’s a beautiful, elegant sight. Inside and out. It’s luxurious too, with marble bathrooms, indoor and outdoor pools and extensive spa facilities. There’s an Andean restaurant and 128 rooms. 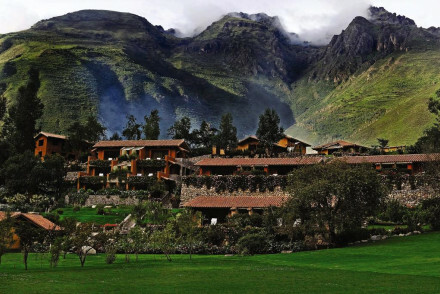 The Inkaterra Hacienda Urubamba is a refined eco-lodge in a stunning spot in the heart of the Sacred Valley. Decorated throughout with Incan metal and designs: Incan antiques and colourful woven fabrics, it’s the floor to ceiling windows which really steal the show. Their organic garden fuels their restaurant and the herb treatments in their spa. The Belmond Hotel Rio Sagrado is a small property with a choice of luxurious rooms or villas, and an extensive list of spa facilities. And the surroundings make it magical as well as luxurious and comfortable. 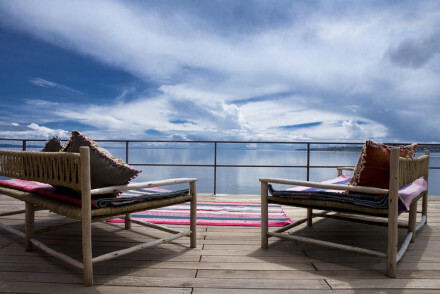 Titilaka is a treat, but it might be worth it, the location, directly overlooking Lake Titicaca, is stunning, and the design of this hotel is superb. It really feels like this is the edge of the world. And in a way it is. You might recognise some of the name, and yes, the Belmond Hotel Monasterio is the same Belmond as the Orient Express. So you can expect a similar kind of romantic luxury and charm here. Built in the 16th century this converted Cusco monastery with its leafy courtyard gardens, antique furnishings and original art and features is a really memorable place to stay. 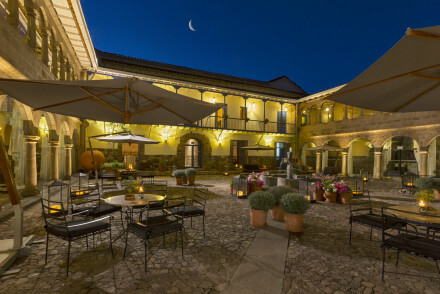 Also in Cusco, the Belmond Palacio Nazarenas shares the first bit of the name too so you can expect the same service and luxury, but this time in a remodelled palace with walls made of stones carved by the Incas. There are 55 rooms and suites, all elegant, but the suites come with their own bar and butler. There’s also a wonderful spa. Inkaterra La Cason is an 11 room hotel in a beautifully converted colonial mansion. If you’re interested in the history of this city then this is the place to stay. Decorated with antiquities dating back to the days of the Spanish Empire. The Peruvian restaurant is superb. And you’re just two minutes walk from Cusco’s cathedral. The Fallen Angel guesthouse is just a few hundred feet from Cusco’s main square. Its five quirky rooms are decorated with bright contemporary art and the restaurant, which specialises in local cuisine, is top notch. Lima’s Huaca Wasi Boutique Hotel is a converted colonial mansion with six chic rooms in well positioned Miraflores. Some rooms have private balconies and views of the gardens. This is a quiet spot but less than a mile from the beach. Rooms start from around £75 per night. 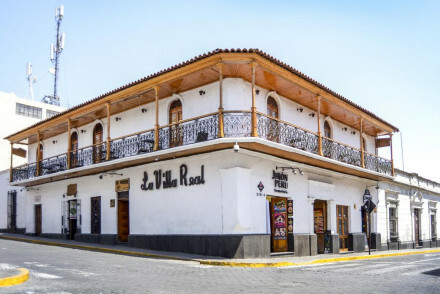 Still in Lima, for around £10 extra per night you can stay at the nearby Antigua Miraflores, a charming, traditional 77 room property with beamed ceilings, tiled floors and a laid-back Peruvian restaurant. Great for seeing the slights. Right in the heart of Cusco, just short walk from the Plaza de Armas, Unaytambo is a large colonial house with 14 rooms - many with private balconies. There’s a beautiful terrace and the decor is colonial too. 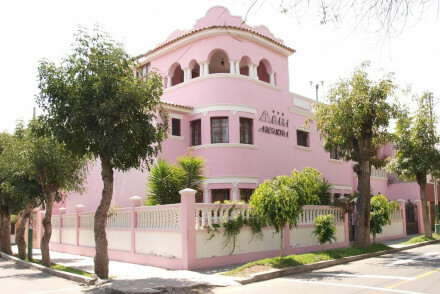 Rooms start from around £80 per night. For around £110 per night you can stay in the much larger Costa del Sol Ramada Cusco, a converted 17th century mansion in the centre of Cusco. There’s still something rather splendid about this 90 room hotel. It’s arranged around an arcaded central courtyard and there’s an excellent Peruvian restaurant. Le Foyer Hostel is the perfect choice for a properly inexpensive stay in Arequipa. It has 24 rooms and a wine range of configurations, ranging from dormitories where you can bed down for around £25 per night to simple, spotless and cheerful double rooms. There’s also a fabulous roof terrace with city views. For Lima fly in to Jorge Chávez International Airport just 11 and a half kilometres from the city. For Cusco fly in to Alejandro Velasco Astete International Airport, which is only 3kms from the centre of town. Here you’ll find a combination of both domestic and international connections. Still not sure which of our recommendations for the best places to stay in Peru is perfect for you? 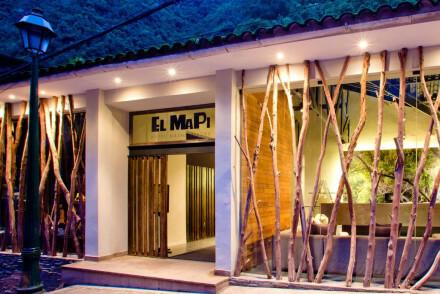 Refine your search to just the best places to stay in Lima? or the best places to stay in Cusco? 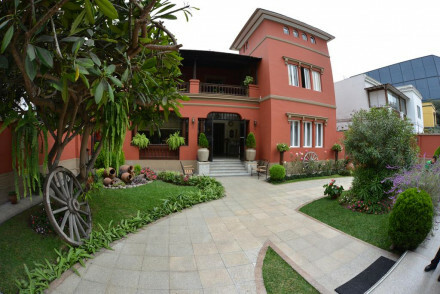 Set in a mansion with chic colonial-style decor in Miraflores, Lima. Some rooms feature private balconies and garden views whilst an American breakfast is served each morning for you to enjoy. Head to the beach or go off exploring Peru's capital! A quiet and rustic city stay. A charming property in a quiet neighbourhood. Traditionally dressed rooms feature handcrafted furniture, pretty tiled bathrooms and beamed ceilings. A laid-back restaurant serves up Peruvian classics and Italian dishes. With easy access to the city's main attractions, this is a smart choice. Local exploring - Situated in a quiet neighbourhood with access to restaurants, shops and a short distance from the beach. Great walks - Take a stroll in the nearby the nearby Miraflores Central Park. Sights nearby - Wander around the Plaza de San Martin, a UNESCO Heritage Site. Local markets - Scour the Mercado Inca for local artecrafts. Unaytambo is located in the heart of Cusco just a short walk from Plaza de Armas. Set in a large house it features rooms with a traditional colonial decor which offer private balconies and plasma TVs. Sit out on the terrace and relax or explore the area! A charming stay in a brilliant spot. Value chic - Great accommodation in a fantastic location. Doubles from $105 per night. 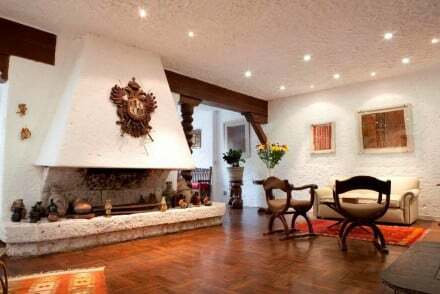 This stunning property is situated in the heart of Cusco, a great base from which to get to know the city. It offers extremely elegant rooms with stunning use of diverse colours and has its own excellent restaurant focusing on Andean ingredients. A top-notch and classy choice for a city stay! Sights nearby - Coricancha, the Incas' temple of the sun, is located less than a mile away and is a must visit! 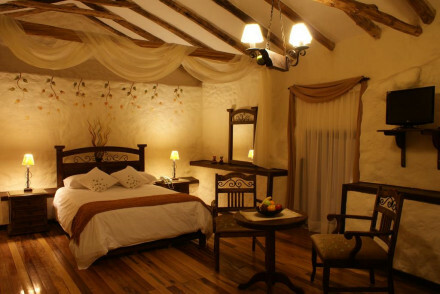 Situated in the Sacred Valley of the Incas in Ollantaytambo, featuring a range of luxury rooms and villas. Forget about all your worries as you make use of their extensive spa facilities or get stuck in with the outdoor activities offered. A breathtaking and peaceful country retreat! Tambo del Inka enjoys a wonderful location in the dramatic Sacred Valley of the Incas, Urubamba. This luxurious hotel features elegant rooms with marble bathrooms, an indoor pool, extensive spa facilities and a restaurant serving typically Andean cuisine. A superb choice to get away from it all. The Marquis of Picoaga's converted 17th century mansion in the centre of the ancient city of Cusco. Retaining its old splendour, the more characterful rooms are set around a charming arcaded courtyard. The restaurant serves international and Peruvian dishes. Ideally placed to explore the city. Local exploring - This central 17th-century mansion is the ideal jump off point for exploring this ancient city by foot. Sights nearby - Just two minutes from La Merced Church, one of Cuscos most important churches dating back to the sixteenth century. Local markets - Just steps from Mercado Central de San Pedro, Cusco's central food market, open everyday.